Even on a night when homegrown hope Phil Foden was handed a Champions League start, it was no surprise that Manchester City's number seven received the biggest cheer when the line-ups were read out. Raheem Sterling was back on a football pitch and ready to entertain against Hoffenheim. From this side of the touchline, it is impossible to imagine what these past few days might have felt like for the England forward, whose thoughtful and pointed post to Instagram after suffering alleged racist abuse during City's loss at Chelsea has caused no end of discussion. Reaction has come from across the football and media industries and beyond, even in a country which now seems to have settled upon political disarray as its new national sport. If there had been a considerable strain, it did not show as Sterling went about his warm-up exercises alongside Leroy Sane – City's eventual matchwinner in a 2-1 comeback win. The two livewire wingers giggled merrily, seemingly well aware of the panic they would sew in the visiting defence and how they would have fun doing it. This, when considering the sum of his considerable gifts, is the true joy of Sterling as footballer. The story of his older sister accompanying young Raheem on a succession of London bus journeys to attend training sessions after school warmed the hearts that fell in love with Gareth Southgate's England team during the World Cup. The kid scampering for his kit bag and weekly saver pass can still be seen within the 24-year-old elite competitor. After his first touch of the ball against Hoffenheim, Sterling darted inside a pair of challenges – an act of carefree dribbling as at home on the playground as the professional pitch. Visiting captain Benjamin Hubner played the school bully, cutting short the ebullient display with a shoulder to Sterling's face. 30. Not the opening half hour we wanted but we'll keep fighting hard to get back in it! 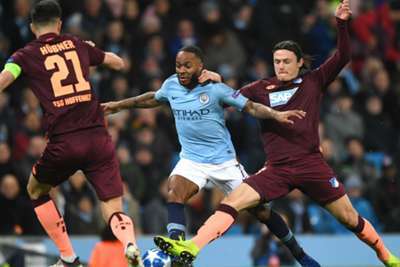 Sane's thunderous free-kick cancelled out a penalty from the excellent Andrej Kramaric and the spaced that opened up at half-time allowed Sterling to work through his repertoire. There was an off-the-cuff backheel to release Gabriel Jesus and a scampering run from his own half that ended with Sane and Bernardo Silva contriving not to score. A 61st-minute pass to the Germany winger was dispatched with a minimum of fuss before Sterling's searching cross brought City fan Foden close to living out his own school yard fantasy, with Oliver Baumann tipping a rasping volley over. The carefree manner in which the Premier League's Player of the Month for November led City's attack felt like a fitting counterpoint to the contorted faces that taunted him at the weekend. One of the men banned from Stamford Bridge pending investigations by Chelsea and the Metropolitan Police, Colin Wing, has denied using a racial slur when abusing Sterling. The 60-year-old is apparently "deeply ashamed" of his behaviour. So he should be because, even if this specific incident was not of a racist nature, what on earth is a grown man doing acting like that inside a football ground? Premier League executive chairman Richard Scudamore was on the mark when he said his competition had "inadvertently fostered safe places for excessive aggression" in response to the Sterling incident. Cries might come in defence of "passion" and heightened emotions make the game feel so vital. But cast your mind back to when you were dashing off to training after school, like a young Raheem Sterling did, dreaming of playing how he does now. Think of your sons or daughters awkwardly pulling on their first pair of football boots, or the first time you took them to a game. You didn't do that so you could have a raging argument with your friends or so you could hurl abuse at people you don't know. You did it because of that feeling when the ball hits the back of the net, those times you hugged long-time friends and strangers alike after a last-minute winner, because you saw players doing things like Sterling did at times versus Hoffenheim. Pep Guardiola was right to point out before this game that racism is societal and not specifically a footballing problem and, amid the numerous lessons to be learned from recent days, it might be prescient to remember it was enjoyment and excitement that first drew us to football stadiums, not bile and hate. They can be special places, even when the world outside appears to have lost its collective mind. Sterling in full flight vividly reminds us why we love a game his despicable detractors make us ponder abandoning. There is no reason to ever let them win.